When you run a 702, the report only contains totals and subtotals. In order to provide the detail on each declared wine or bottled product and to provide important trouble-shooting detail, vintrace provides the TTB Breakdown report. You can find it under Reports > Government reports. Except for some of the special classes, only declared bulk wines and packaged wines are reported in Part I and Part II. In order to reconcile and ensure that you are reporting accurate numbers, having detailed information by batch (for bulk) or by stock item (for packaged goods) can make it much easier to pinpoint inaccurate data. To use this report, run it for the same time period as your “in-process” 702. When you click Generate, this report will output to Excel as a CSV file. Depending on your browser/system settings, this report should open directly in Excel; if it is marked as PROTECTED VIEW, click the Enable Editing button. Notice the top left cells – confirm that you have the correct reporting period and the correct bond (critical if you are operating in a multi-winery environment). 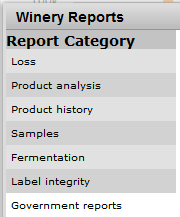 Columns A-D on the Bulk tab list Wine batch, Description, Vintage, and Owner. Columns A-C on the Bottled tab list Stock Item, Description and Owner. First check your ON HAND BEGINNING OF PERIOD. These figures should match the ON HAND END OF PERIOD for the previous reporting period as finalized and reported to the TTB. 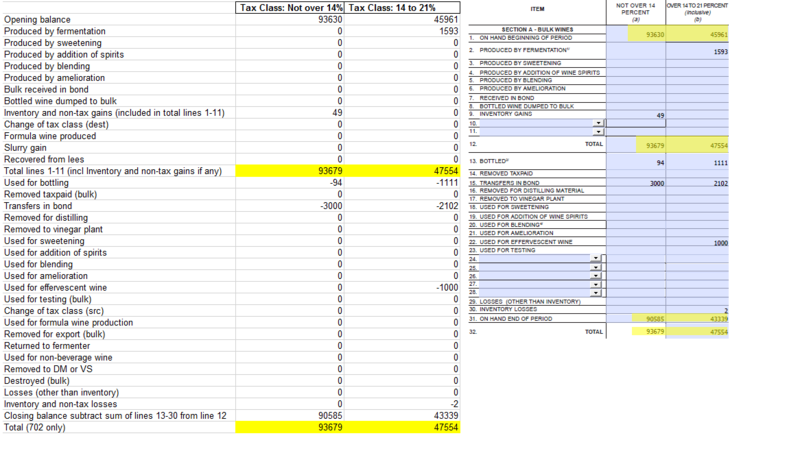 If there are discrepancies, re-run the TTB Breakdown report for the previous period. You should be able to find which batches/stock items ending balances don’t match up. The most common cause is operations that were back-dated into the previous period AFTER the 702 had been filed. You may need to file an amended 702 for the previous period; click here for information on creating an amended 702. If you have questions, consult with your Compliance Officer, your legal adviser or the TTB. Here are two side-by-side comparisons of the TTB Breakdown for Bulk Wines and the 702 for Bulk Wines.